Mix the flour, salt and dry yeast and knead with the lukewarm water (the resulting dough should not be too soft). Add olive oil and continue to knead until the dough achieves an elastic texture. Cover the dough with a cloth and keep it in a warm place until the risen dough becomes twice its initial size. The pizza dough is now ready to be punched down and made into 4 8- inch diameter rounds. Preheat the oven with the baking tray inside to 480 degrees F.
While the dough is rising, prepare tomato sauce by combining tomato paste, thyme, olive oil, water, salt, sugar and pepper together in a bowl. Combine mushrooms with olive oil, tarragon, salt and pepper. 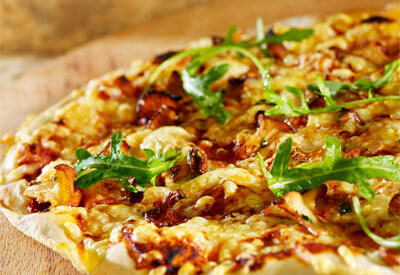 Spread a thin layer of tomato sauce on each dough round and sprinkle the Jarlsberg on top. Place seasoned mushrooms on top of the Jarlsberg. Bake the pizza on the preheated baking tray in the lowest level of the oven until golden brown; about 12 to 15 minutes. Sprinkle arugula (rocket salad) on top when serving the pizza.